eYeka adds new features for you! Today we have something new for you on eYeka. In our efforts to bring you the outstanding services you deserve, we are trying to simplify everything as much as possible and make it user friendly. Below, on the image, you can see how we have restructured our website: What used to be on "My groups" is now directly on "My eYeka", saving you some extra clicks! This is only a first step to make it easier for you to keep track of the contests you have joined. 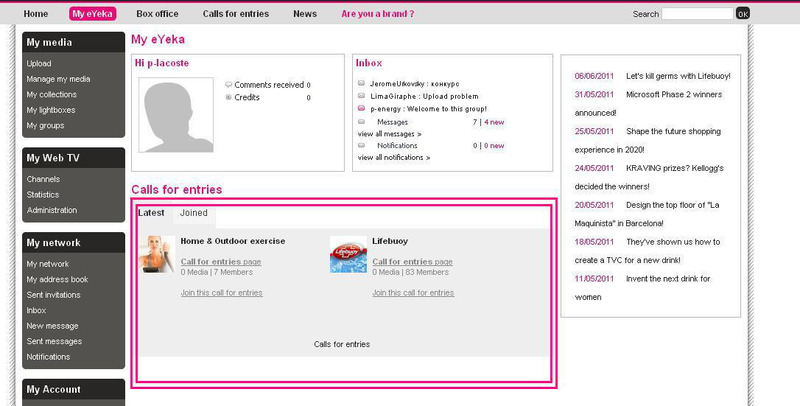 Furthermore, we have added a link saying "Calls for entries" - follow it and discover all that is running on eYeka at the moment. At the moment you can only see two contests but we will shortly add more info on all the contests that you have joined. Please, bear with us, just a little longer!